Birds and wildlife flock to this natural setting like an oasis in the desert... and there's a good chance your friends will try to do the same when they see your beautiful home. If you watched the video, you know these homeowners put as much thought and emphasis into the land as they have the home. They created a sort of wildlife oasis in the middle of acres and acres of farmland. 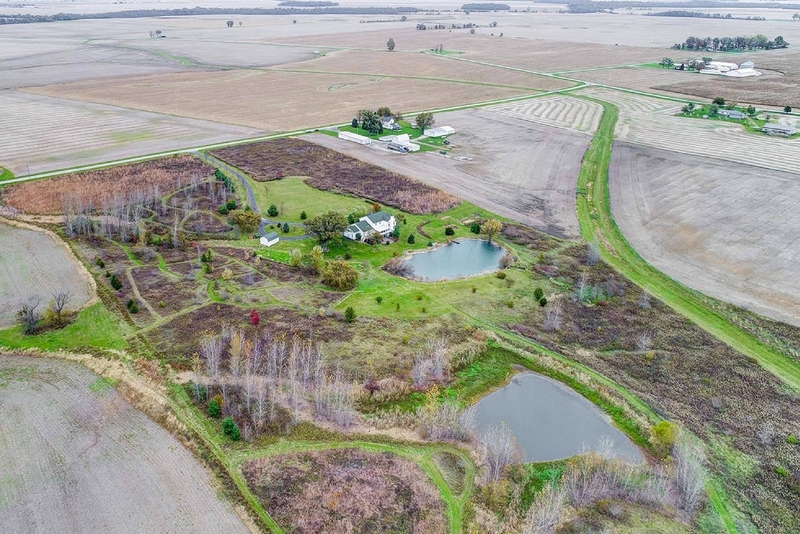 Not only have they enjoyed their own 20-acre nature preserve, but they've also enjoyed tax advantages for letting the land recover after years of being farmed. You'll enjoy bird watching, deer grazing, fishing or swimming in the ponds, and just connecting with mother nature. I even saw a flock of pheasants while I was there. This very functional kitchen is a perfect setup for both serious cookers and serious entertainers. 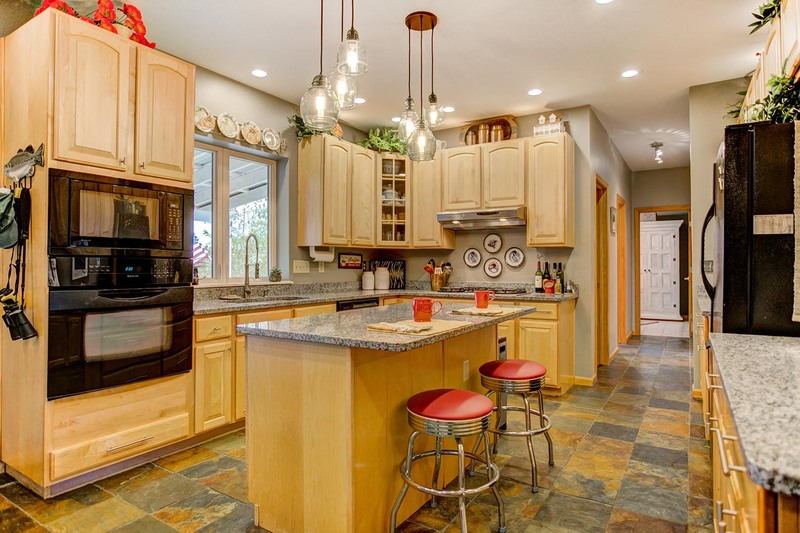 Granite countertops, 42" cabinets, electric oven, propane cooktop, and a walk-in pantry for the chef. A large island with seating, open lines to the great room, and direct access to the covered back deck for the entertainer. There is even a window over the sink with a perfect view of the large pond. It's easy to see that this floor plan was thought out ahead of time... 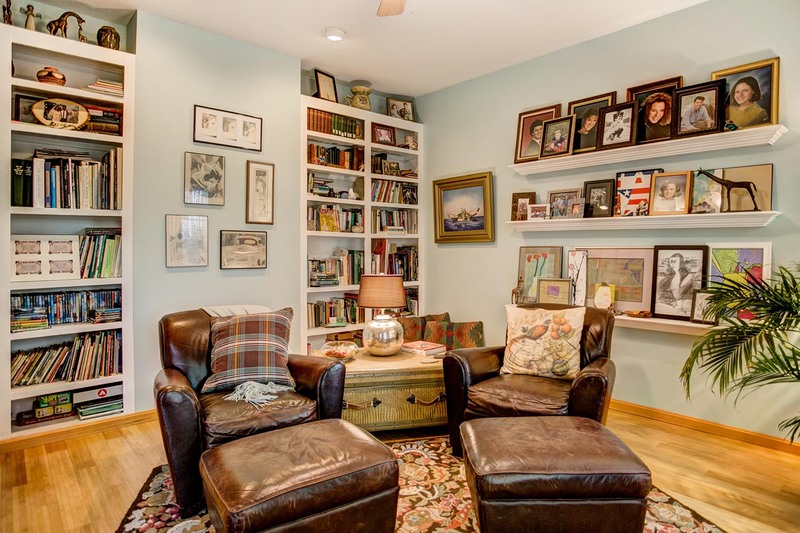 Separate office and library spaces provide a place to get your work done (usually cluttered) and a place to relax with a great book (clutter free). A first-floor owner's suite provides convenience while the arrangement of the second-floor bedrooms offers an option of a second owner's suite. The lower-level is great for guests or parties as it walks out to a covered patio overlooking the pond. The great room and kitchen are... well... great. And did you see the size of that laundry room? First Level: Your guests are sure to appreciate the first view of your new home when they step into the beautiful foyer. A two-story ceiling rises above the staircase and carries into the great room. To your left is an office and to your right is the library. The library features floor to ceiling bookcases, hardwood floors, large windows, and double doors that can be closed for privacy. It's an amazing room as situated but it could be used as a formal dining room if needed. Continue deeper into the home and you arrive in the kitchen and great room, with sweeping views of the property outside. The slate floors of the kitchen continue down a side hallway that leads to the walk-in pantry, powder room, and the huge laundry room. The laundry room has a door coming in from the garage and going out to the deck. Back in the kitchen, 42" cabinetry feels like the perfect choice for these 9' ceilings that feature recessed lighting and trendy pendants over the center island. The space reserved for your kitchen table has a great view to the outside. From here, take a few steps onto the hardwood floors, gaze up at the 17' vaulted ceilings, and admire the great room. The room appears massive but it feels very cozy when you sit here. The wood burning fireplace has gas ignition making it easy to warm yourself on a chilly night and the windows flanking it adds natural light (and more great views). Your owner's suite is adjacent to the great room. This bedroom is large, has lots of windows, and great walk-in closet. Your private ensuite includes a soaking tub, shower, vanity, and linen closet. Second Level: These homeowners built the home with the thought of having their mother live with them... so instead of having your typical guest bedrooms sharing a bathroom, they laid it out so it could feel like a second owner's suite if needed. Both bedrooms up here share the level's full bathroom, but the "second suite" has direct access to it. This bathroom is very large so if there are two occupants sharing it, there shouldn't be any problems... in theory at least! As you can see, it's also a perfect place to have a telescope for watch birdwatching and stargazing. Lower Level: The walkout lower level can be a second living area, rec room, guest level, or provide the "lakehouse" vibe for your parties. The main room down here is a large space that includes built-in storage, large windows, and even another range and refrigerator (told you it would be great for parties). There is another bedroom and a third full bathroom off to the side and still enough room for storage or a workshop. Step out the sliding glass doors and you'll find the covered, lower patio. Exterior: The paver patio has a covered area providing shade and shelter from the rain, as well as an uncovered area with a built-in fire pit. Above the patio is a covered deck. You can access the deck from the kitchen, laundry room, or side yard. Get some comfortable furniture for this space because you're sure to spend many evenings enjoying the amazing views from this raised level. There are two ponds; one that has been great for fishing and swimming and one that's incorporated into the wetland area. The homeowners kept trails mowed throughout the prairie areas so they could enjoy walks, golf cart rides, and maybe even a go-kart race or two. And last, but not least, we can't forget to point out that the stately tree next to the home (likely 100+ years old) is the perfect place for a simple swing.